Not many of you out there know about my hubby L. He's a dysfunctional man, quickly bored with anything that has to be done every day or every week. He no longer lives with me. Almost two years ago now, L was desperate to have a pet. My lease clearly states, in capital letters, NO PETS. Between us we decided that goldfish might be okay, low maintenance, they wouldn't dig up the yard like a cat or dog would, didn't require large amounts of food and certainly wouldn't need to be walked or groomed. 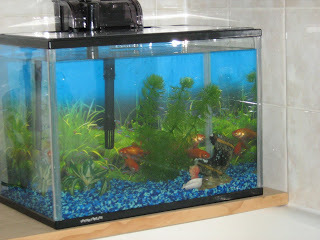 So we bought a small aquarium, with all things necessary to set it up included in the box, and brought it home. There's nowhere here to put such a thing, so a plank of wood was put across the end of the bathtub and the aquarium was set up on that. Two days later, we brought home a half dozen comets. L promised he would do all the work necessary. The Royal Show will soon be coming here to Adelaide, as it does every year. The weekend paper has a listing of all available show bags. This year there will be 328 different bags. How the heck does any kid choose from such an enormous number? I guess a lot of kids have their favourites, Dora the Explorer, Girl Power, Bob the Builder, Transformers and so on. Many adults too, with mums choosing Darrell Lea or dads choosing the Giant Licorice one. I don't know how things are done in your town or city regarding the sale of these bags, but over here, they are all housed in one huge pavilion. Stall upon stall of different bags. I can imagine the chaos in the first couple of show days, with thousands of parents and their kids all clamouring for their favourite. By the time the show is half over, sometimes even before, many of the current "big favourites" have sold out. After so many recent botched attempts, I got it done just perfectly. I'm talking about garlic bread. I like to eat it alongside pizza. The instructions do not say, put in oven, then forget about it while you read several blogs. Yet this is what I've been doing. I've thrown out so much blackened garlic bread lately, I actually had second thoughts about buying the new packet this morning. Well, I did buy it, I baked it perfectly, and it is yummy. Hot, buttery, garlicky. And golden brown, just as it should be. Being unable to properly stretch out the shoulders, I'm finding it difficult to wash myself. So I've come up with a solution. See? 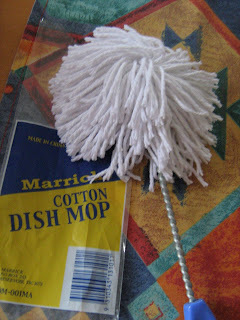 An old fashioned cotton dish mop. A little bend in the handle, soap it up, and underarms are more easily washed. These are the two chairs I spent most of the day in last Sunday. Just look at that glorious sunshine! I like this one because it's adjustable, also because of the footrest, so I can lay back with feet up and just soak up the sun and fresh air. This is the folding bamboo chair that hubby brought home after someone tossed it out for the hard rubbish collection. Look at the lovely markings on the bamboo. It's a very upright chair, but still comfortable. Lastly, this year's very first blossom, on the tree which, this year, will finally be large enough to shade my front window. I hope I've brought some smiles today. I'm eating sweetened condensed milk straight out of the can. 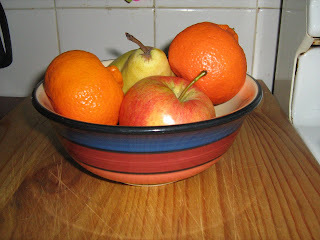 I've been reading several cooking blogs and focussing on the sweet recipes, because I love sweet stuff. so I'm eating sweetened condensed milk straight out of the can. Because I was a good girl and already ate my baked beans and toast. And I don't have any vanilla slices handy. Top of the list right now is my habit of buying in bulk whenever I'm able to. I'm sitting here typing this, (der, obviously), out of the window I see the wind blowing the trees this way and that, intermittent rain pounding the windows and making a lake of the driveway, knowing that if I didn't want to, or was unable to, I wouldn't have to leave my warm and comfortable home for at least a fortnight or quite possibly longer. The only thing I'm likely to run out of is fresh fruit and veg, even that isn't a concern since the freezer is full. Second is the internet and all the wonderful bloggers I've found here who help me pass the time, who make me laugh, cry and most important of all, you all make me think of things other than my own situation. I'm grateful that you all take me out of myself. Third; my family. We're not as close as some families are, but they're there, and if I need them, they'll come and help. I love you all. While I'm at work, I'll sometimes plan my afternoons. Then work gets insanely busy and by the time I get home, all I want is to crawl into bed for a nap. So I do. When I wake up it's too late for any of the things I planned to do. When I have a holiday coming up, like a long weekend, or maybe a week of annual leave, I'll make plans for each of the days available. Most of these don't work out. If I plan to go walking with my camera, it will rain every day, and I don't like the camera to get wet. If I plan to shop for a few new things, I'll get home on the last day of work to find a huge electricity bill waiting for me. If I plan to visit kids or friends, more often than not, they're out or otherwise occupied and a visit would be inconvenient. I have noticed that when I don't make plans, I have days and days of beautiful weather stretching ahead of me, but since I haven't actually planned anything, I can't decide what to do. 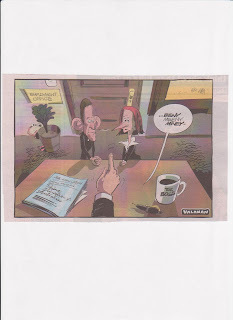 The front page of today's Adelaide paper, the Sunday Mail, tells us we have a hung parliament. Pretty much as I expected really. So the counting continues, with postal votes trickling in from all over the country, maybe even a few absentee votes still coming in from overseas. Today is a perfect spring day. Yes, I know it's still August, so not "officially" spring, but mother nature has seen fit to give us a taste of things to come. The upturned bowl of our sky is a beautiful blue, ringed by streaky and fluffy clouds visible over neighbouring rooftops. The wind is cold still, but the sun is so wonderfully warm. If a place in the sun, out of the wind, can be found, outside is a beautiful place to be today. I have such a place, just outside my front door. A breeze finds its way there, but the main gust of winds misses it. I've dragged the lawn lounger out from its hidey-hole, brushed off the spider webs and set it up. We've all done our bit. Trudged, walked, ran, drove to the nearest polling booth, at whatever time of day. Some of us went to the usual spot only to find that this year the polling booth had been moved. Huh. Further to walk, but that's okay, the weather was nice, cool and sunny, a few clouds here and there. We had our names crossed off the list, we made our marks on the pieces of paper. All of us hopeful that our chosen party would reign supreme at the end of the day. So now the counting begins. Votes from all major cities, large towns, small villages, outlying rural areas. Absentee votes. Postal votes. How many hundreds of thousands? Imagine sorting the papers, counting the stacks, someone making a joke, everybody laughing so hard they lose count and have to start over....wouldn't happen of course. The welfare of a country is at stake. Our country. Our multi-cultural home. We all have opinions on how the country could/would/should fare. Early this morning I was lying in bed, being lazy, as I sometimes do, when I glanced over to my shelf and noticed Henry. Henry is a stuffed bear, and yes, all my stuffed animals have names. It's a childhood carry-over. 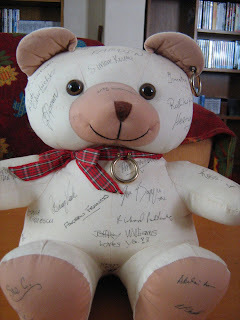 Henry is a calico signature bear, you may have seen these in Post Offices and newsagent/gift shops a few years ago. Way back in 1999 when I heard the shoe factory was closing down and moving operations offshore, I wanted something to remember all my friends by. From there, Henry moved into other factory areas, the womens shoes line, the very large childrens shoes area. You all know the Clarks Kids range, I'm sure. School shoes, first walkers for babies, toddler shoes. This is the cartoon from today's Advertiser. It might have come out clearer if I'd used my camera instead of my scanner. Just in case you can't read it, here is what it says. Yellow wall sign on left; Employment Office. Blue papers on desk; Job Application, position applied for: Prime Minister. The applicants are clearly Tony Abbott, cleverly wearing a suit instead of his budgie smugglers, and Julia Gillard, not frowning quite so hard and keeping her hands safely folded.In my opinion, be it ever so humble, this is as good a way as any of choosing our next leader. Last Monday was my birthday. There were no candles on my cake. There wouldn't have been enough room. 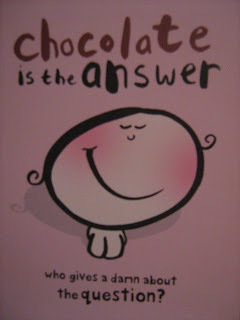 Certain members of my family have a knack for finding the perfect card. So true. We all had a lovely family lunch on the Sunday, I haven't seen my lounge room so full of people for quite a while. We rarely all get together like this, everyone is too busy doing what they do. So major holidays are when we all catch up with what's going on. Of course, there's always email and phone calls, but nothing beats getting together enmasse. I've learned that my ex-father in law is in the hospital here. He has emphysema and pneumonia. He's a tough old thing and could get well enough to go home again. Here's where I fall apart. Should I go and see him? Should I not? I distanced myself even further when K and I divorced a few years after that. It's what I do; it's how I cope with emotional pain. I haven't seen K's parents since that time. What to do? I kind of feel like I should go and see him, but part of me says why? Would he even recognise me after all this time? It's been 20 years. He's 85. 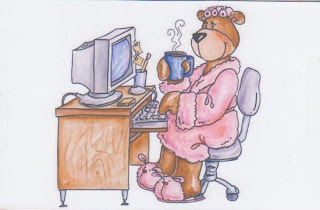 Slopping around in my dressing gown, drinking coffee, surfing the web. Day two of being officially off work. Not too bad so far. I'm finding that I like getting up after the sun, staying up a little later at night. But I can see that I could get used to laying on the couch all day very easily, and soon enough my bum would be as big as the couch. So I've resolved to go for a walk at least once a day. Today's walk was taken in this morning's sunshine and I took my camera with me. I had intended to take photos of whatever took my fancy, just strolling around the neighbourhood. Didn't work out that way. As soon as I was far enough away from home, so that turning back wasn't an option, I needed to pee. Tucked my camera into my jacket pocket and headed for the nearest shopping centre. By the time I got there I was getting a little desperate, almost to the point of trying to walk with crossed legs. In the words of "Effie", How Embarrassment. I was alerted to these by Kath Lockett of GoneChocco fame. You'd think I would have noticed these myself, working in a supermarket as I do. .... a few more. Before I knew it, half the packet was gone. These are seriously yummy. Chewing them is fine, but letting one melt on your tongue is also good. The chocolate melts fairly quickly in the centre and lets the caramel break through, so you have both flavours melting together. 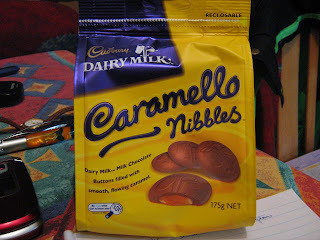 If you like the Caramello blocks you'll like these. The taste is a little different, somehow nicer. The caramel in the blocks is smooth and sweet; in these tasty little morsels, the caramel is ever-so-slightly gritty and that makes it better somehow. My shoulder hasn't been getting any better, in spite of much resting, limiting my lifting at work, and many, many tubes of Deep Heat, Voltaren, Goanna Arthritis Cream. Not to mention a truck load of Panadol. So back to the doctor I went. Had an ultra-sound and several x-rays. Guess what? I have a small tear in the rotator cuff. As well as a little bursitis. Doctor is recommending surgery, which means about six weeks off work. With my arm in a sling. To a vending machine near you. I've just watched Today Tonight. An article on canned foods from vending machines. A $$$$ producing expanding market. But let's get back to the vending machines. We've laughed at stories and emails sent around about spray can cheese, (cheezwizz? ), we've seen the whole canned chicken. Even the canned cheeseburger; boil, (in the can), open, eat. Peanut Butter and Jelly on a roll; sealed, vacuumed, canned. Cinnamon Roll with chocolate drizzle; sealed, vacuumed, canned. BBQ Chicken Roll; sealed, vacuumed, canned. This beautiful tree is in a yard adjacent to mine. 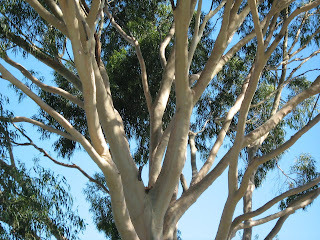 I see it everyday, through my lounge room window, walking up my driveway, when I'm raking the leaves off the front lawn. 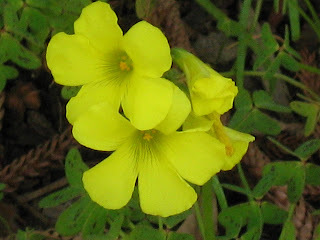 I took these photos last summer, using the zoom lens on my camera. This one in mid afternoon. This one a few hours later as the setting sun bathed the branches in gold. This last one after the sun was down but before the dark of night settled. Can you all see the bird in it? For more than seven years I've been looking at this tree as I lay on the couch, but today for the very first time, I noticed the tree is flowering. I was walking up the driveway and glanced at the tree to see it almost completely covered in creamy blossoms. I didn't have the camera with me, so there's no photo. Sorry about that. Last Wednesday morning, on my way to work, I noticed a thick bundle of store catalogues poking out of my letterbox. I thought about pushing them all the way in, but didn't, figuring it would be easier to just pull them all the way out when coming home again, instead of fishing for the key, unlocking the box, locking it up again. Well, it rained. Hard. Most of the day. So the catalogues were soaked by the time I got home. I separated them carefully and draped each one over the clothes rack in front of the heater. By Saturday evening they were dry enough to read. One of the K-Mart ones was dvd's and games, every page. Several of the pages had cowboy movies pictured. Woo-hoo!! Cowboy movies!! I love these. Many of the titles were old favourites that I'd been longing to see again. Shenandoah, Rio Lobo, Rio Grande, North To Alaska and others. And they were only $7-$9 each! P.S. I don't wear make-up either. One of our regular Sunday columnists, has written this week about shoes, describing several of the pairs he has owned over the years. Usually such a topic is tackled by female columnists, who go on to describe the many pairs they currently own. Let me say, here and now, I do not understand, or share, this fascination with shoes. I own three pairs of sneakers, one for work, (black); one for weekends, (white); and my old work sneakers that I now wear while doing stuff in the yard. I also have a pair of rubber boots for when the yard is muddy, but I almost never wear them. If the yard is muddy, I'll stay inside. I have a pair of flat sandals easily ten years old, possibly twelve. I have two pairs of ankle high fake fur soft slippers. Why two? Because I totally forgot that I still had last year's almost-never-worn slippers when I bought this year's slippers. I have a pair of rubber thongs, (flip flops). This is my entire shoe supply. There are no boots, with or without heels. 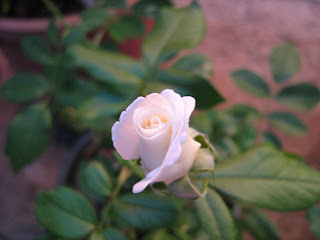 The same yard had two other bushes, each with rosebuds. A pretty way to get part of your daily fibre requirement. I bet y'all thought I was going to write about wine, didn't you? But don't get fooled, this won't be a regular thing. Cooking tips are not my thing. When making cream cheese frosting, the Light Philadelphia Spreadable Cream Cheese, will give your frosting the slightly gluey texture often found in diet frostings and sauces. This is probably due to the Guar-Gum and Locust-Bean Gum in the cheese. This is what makes it spreadable I suppose. I don't like this so much, so next time I'll stick with the regular block Philly. Full cream or full fat or whatever it is. All of you out there can make your own choices. Now, here is the real tip. Do NOT mindlessly taste test the frosting until there is barely enough to cover your carrot cake. if blood nauseates you, don't read this. I have an umbrella that I rarely use, because it's a little difficult to close. I keep it in my locker at work as an emergency brolly. Today I needed it, as it was pouring rain when I was leaving work. Once home, I left it open in the shower to drip dry. Then I tried to close it. It pinched my finger pad, ripping off a miniscule piece of flesh. Covered it with a bandaid, which looked like this immediately. Within a minute, the absorbent pad was completely soaked and blood was seeping through the sticky part of the bandaid. All the way around the finger and pooling in the groove around my fingernail. 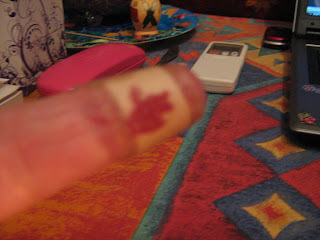 Soon after, blood was dripping off the tip of the bandaid. Who knew such a tiny, wound could bleed so much so quickly? At this point, I removed the yucky bandaid and put on two clean ones. The bleeding has slowed considerably, but that tiny wound is going to sting when I get it in hot water tomorrow morning. Today, I had my first ever massage. It was a lovely experience, although a little painful. I'm told I can expect to be a little sore tomorrow, but since I'm achy all the time anyway, it's not likely to bother me. Too much. I hope. My niece G came to visit me recently and we got to discussing our genetic inheritance. Both of us are fairly inflexible in the neck and shoulder area, I remember my mum was too. G asked if I'd ever had a massage, she has them on a regular basis and they help. I said I'd never had one. A week later, G dropped in on her way home from work with a surprise gift for me. Two gift certificates, each for a half hour massage at the Sports Med clinic. I had one today and made the appointment for the second later in the month. The last time I made a *beef stew, I froze four individual sized portions for future meals. Today I thawed the last one of those for dinner. I planned on having it with mashed potato and green beans. But, I had no potatoes. I'd used the last one on the weekend and forgotten to buy another one on my way home today. So I turned it into a curry and served it over boiled rice instead. Gently heat two teaspoons of oil with a teaspoon of curry powder. When smelling fragrantly of yummy curry, add some thinly sliced vegetables. Whatever you have handy is fine. I had a half carrot, a half red onion and a broccoli stalk. Stir until veg is softened, add left over beef stew, simmer until heated through, while rice cooks. * This particular beef stew is more of a stovetop casserole with a canned tomato base and no gravy thickening. Gravy based stews don't do well as curries when using up leftovers. Long term writer of columns for our Adelaide newspapers. 90 (NINETY!!) years old today. And still writing a weekly column. I've been reading Max's columns for years. They always make me smile, sometimes bring a tearor two to the eyes. I hope someone made you a cake, or at least brought you a cream bun. CSI kit for wary parents. This article was written by Roxanne Allan. "A South Australian designed CSI-style forensic kit will allow parents to fingerprint and DNA sample their children as "insurance" in case they go missing. The Find Me Safe child identification kit contains police-quality fingerprinting technology and a DNA sample bag for hair and skin follicles, as well as card to record a child's handwriting samples." The headline caught me, because I've long been a fan of CSI and other forensic type TV shows, like Bones and Vanished Without A Trace. I realise that TV shows are neatly packaged to show the crime, the search, and the happy (or not so happy) conclusion in a little less than an hour. In real life, the search part would take considerably longer, DNA testing can take weeks or months to complete and a conclusion could very well take years. Many, many years.